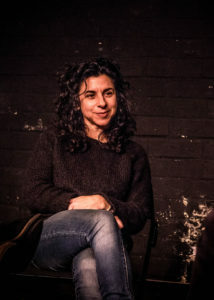 Katie Pearl is a director, playwright, and performer. As co-Artistic Director of the Obie-winning PearlDamour, she has a 20-year history of creating genre-defying works like How to Build a Forest, MILTON, and Nita and Zita. Recipient of four Map Fund, two NEA, and a Creative Capital Award. Pearl has been a Voice and Vision, Berkeley Rep Ground Floor, and SPACE at Ryder Farm artist. She was the 2017 Quinn Martin Guest Chair of Directing at UCSD, a 2016 Anschutz Distinguished Fellow at Princeton and a visiting lecturer of Socially Engaged Art at Harvard. Currently at work on Ocean Filibuster with PearlDamour, co-commissioned by the American Repertory Theatre and the Harvard Center for the Environment. Pearl is a producer of The Rest I Make Up, a documentary on playwright Maria Irene Fornes, which premiered at MoMA in NYC and is currently screening world-wide.